Boca Grande, on the Grand Barrier Island called Gasparilla, is a step back into “Old Florida” a carefully preserved part of Florida’s history and beauty. 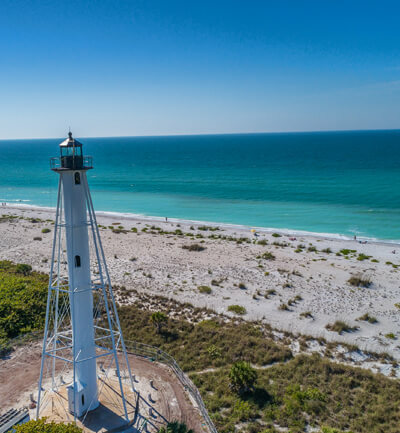 Located midway between Fort Myers and Sarasota, split between Lee and Charlotte Southwest Counties, Boca Grande is a retreat for the wealthy, visitors and fishermen. Here you can immerse yourself in the natural surroundings or enjoy the shops and restaurants in our historic village. It is one of those unique little towns that you have always dreamed of escaping to. It’s a place where you can get away from the high rises and traffic lights. Park your car and walk, bike or take a golf cart anywhere on the island. White, sandy beaches stretch the entire length Gulf side of the island, and the sunsets are spectacular. Boca Grande is a place where active boating, shelling and fishing is greatly encouraged. Come relax, enjoy and see for yourself, all that this unique Island has to offer. If you are looking to sell, invest or purchase a “piece of paradise” on Boca Grande, our Sales Team at Boca Grande Real Estate has the knowledge and experience to assist you. Boca Grande Real Estate Sales and Vacation Rentals are brought to you by a highly trusted source in Florida’s community. we are "Boca Grande Real Estate"